August 18, 2017 November 30, 2017 JohnGames Master Tips / Gaming / Get Involved / The Quest for the Perfect Roleplay Game3 Comments on The Quest for the Perfect Game Chapter 6: Epilogue – Get Involved! Hello Everyone, and welcome to the concluding part in my series “The Quest for the Perfect Game”. 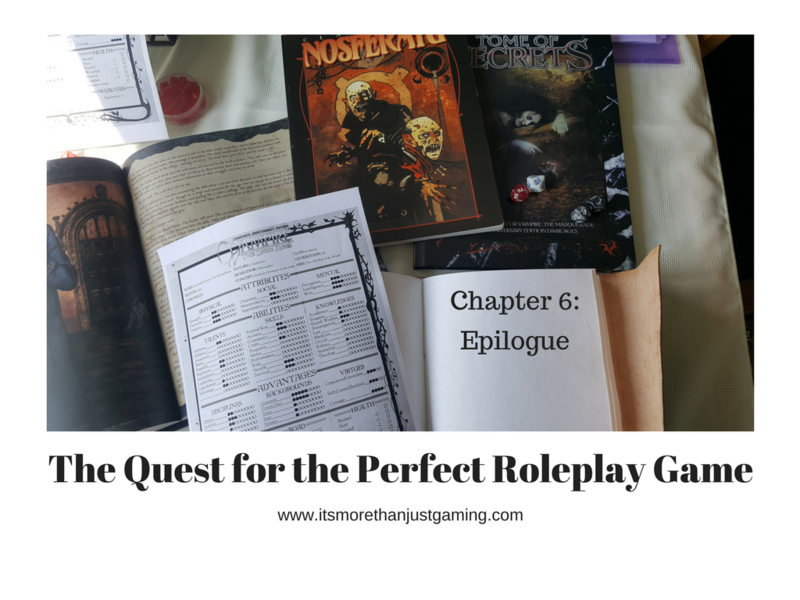 Hopefully you will have come to realise that for me Roleplay Games are simply one more form of media for creating fiction, just like a book, a play or even a movie. I daresay if I pull out my old student habits and University Library Card (which probably still works…) I could write an academic argument that this makes the games we play literature. Truth be told I have raised that suggestion in class, and my tutor was not totally against the idea. However, I digress from the point which is that the game is a story which everyone at the table has a responsibility in creating. I am going to borrow from my own personal stock of literary theory. I use three words, which other people use interchangeably. Narrative, Plot, Story. Narrative is a sequence of events. Plot, is how a writer assembles these events, and story is what happens when plot meets reader. By my definition, all consumption of story is a collaborative exercise, whether the reader or writer acknowledges it or not. And if this sounds familiar to you, I apologise, I have shared this theory before in one of my previous articles but I have no shame about sharing it again. A roleplay game is actually a very good representation of this system. The Narrative is supplied by the Games Master, in essence that is the framework for any game which may include input based on characters. The Plot is represented by the hook into the game, and what the players do with their game. The Story is the dialogue between player, character, non player character and Games Master. It is a fully collaborative, even if competitive, creation. This works best with your picked group who have similar expectations of the game, but not necessarily within the game. All of this can be true of any roleplay experience, whether you are wanting an open world sandbox for your character to play in or whether or not you are playing a dungeon crawl. Both types of game benefit from players with the same expectations, a bond of trust and an open approach to the start of the game. I once heard of a gaming group for whom roleplay was basically a dungeons and dragons first person shooter. The heroes collected their quest and then teleported to the location to kill all the bad guys and steal all the treasure. If that is what you want, that is perfectly fine, but the purpose of this series was to outline that roleplay games can be so much more than they often are. So, over to the readers. Some of you have already commented, but I wanted to know, what your is takeaway from all of this? Has this changed your opinion of Roleplay Games? If you are a roleplayer does this impact what you will do next? If you are a Games Master has it given food for thought? Are you someone who doesn’t roleplay but you have taken something useful away from this? If so, what was it? Over to you. Thanks for reading, remember it’s all about the fun and it’s more than just gaming!